When you go to an educational conference, you probably expect to learn a couple new tips, hear some new ideas, and meet a few new people. It’s rare that a conference is so jam-packed with valuable knowledge that it impacts how you do business. That’s exactly what happened to us at INBOUND 2017. 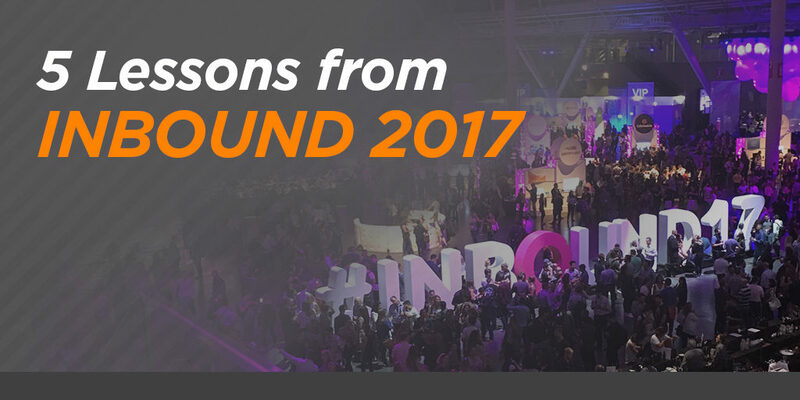 INBOUND, put on by Hubspot, brings together 21,000+ marketers for 3 days worth of inspiration, education, and networking. As a marketing agency who’s been around for 20 years, we know a lot about marketing, but we’re always looking to learn. The conference didn’t disappoint. We boiled down our pages and pages of notes into 5 key lessons that will help shape our business, so we can continue to grow and help our clients grow too! We live in a world of on-demand video, ad blockers, and Do Not Call lists. People are tuning out traditional advertising, and no one wants to be “sold to.” How do you market your business when no one wants to hear about your products and services? Coined by Hubspot CEO Brian Halligan, the term inbound marketing describes the process of attracting, converting, and delighting customers by providing helpful, relevant content. It relies on non-interruptive techniques that naturally pull people toward your business – techniques like content marketing, social media, and SEO. It’s exactly the opposite of outbound marketing, which pushes messages about your products and services through traditional advertising, cold calling, etc. 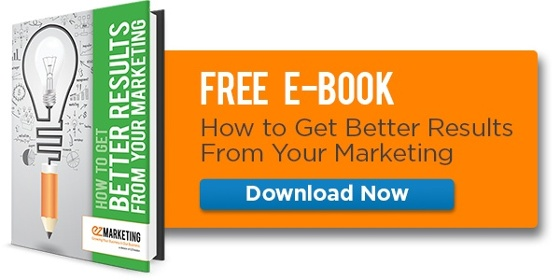 What's So Great About Inbound Marketing? First, it aligns with modern buyer behavior. Buyers today research online, they read reviews, and they compare you against your competitors. Their buying decision may be more than half over before you even contact you. Inbound is all about nurturing prospects through the sales funnel so they know, like, and trust you before they buy and love you afterward. Inbound marketing is a revolution because it relies on a fundamental shift in how you look at both sales and marketing. It’s no longer about pushing the product or closing the deal. It’s about helping and building a relationship. And that concept is hard for a lot of businesses – most of them in fact. During the conference, Hubspot CTO Dharmesh Shah talked about the concept of “growing better” – and not just in the sense of moving the revenue graph up and to the right. He focused on how helping whenever, wherever, and with whatever the customer needed was the key to being a better business, which in turn generates growth. That’s how inbound empowers businesses. We’re always inspired to be a better business – hoping you are too! A few years ago, searching for something like “what are the best lunch spots near me?” would have been laughable. Google relied on detailed queries and keywords like, “restaurants, Lancaster, pa, yelp 5 star review.” Now, however, we search the way we talk. We can type (or even speak) detailed conversational queries looking for very exact answers. Rather than relying on exact keywords, search engines are getting better and better at understanding context to deliver more relevant results. They recognize natural language, geographic location, time of day, and even what device you’re using. Furthermore, Google is getting better at providing quick answers in user-friendly formats, which isn’t always the top ranked result. 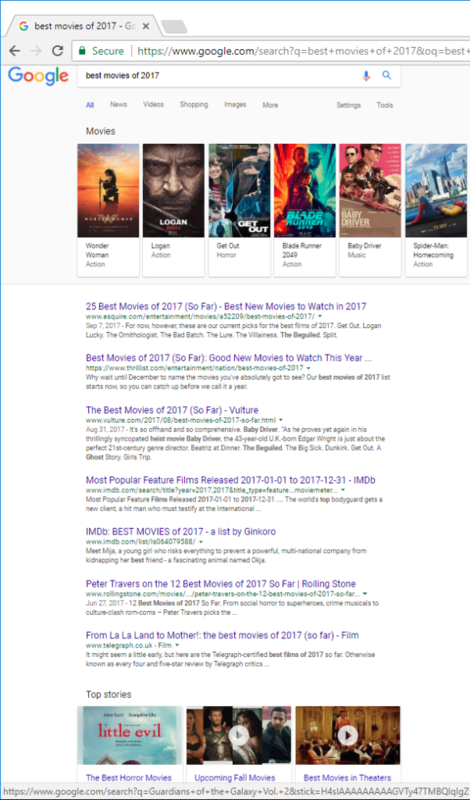 For example: search for “best movies of 2017.” Notice the row of movie images at the top, and even the news stories further down the page. Between image results, featured snippets, knowledge cards and more, 93% of search results are no longer just 10 blue links. We need to get better at organizing information so that more people can find the information they’re looking for, faster. Clearly, future of SEO is more complicated than just claiming the #1 spot on Google. So what is the answer to this shift in SEO? One rising trend is the use of topic clusters and pillar pages. Topic clusters are groups of content about specific subjects, targeting long tail keywords that are organized around a broader topic, or pillar. If you’re blogging right now, you’re probably writing a bunch of individual blog posts to rank for specific keywords. The problem is, these individual pieces of content can get disorganized, making it hard for searchers to find information quickly. It also means that your own content might compete against itself if you write multiple posts covering similar questions. 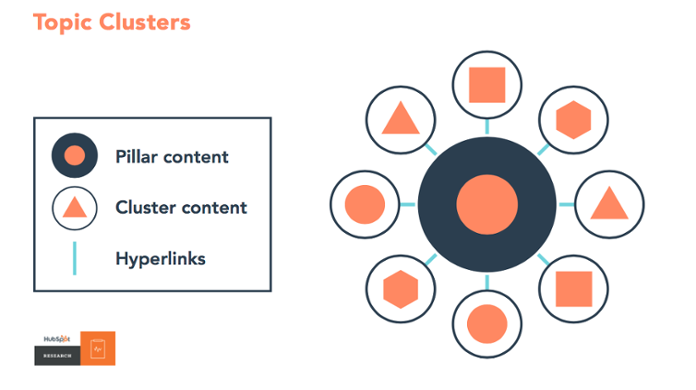 With content clusters, you take all your related content and link it back to one broader topic. Your central topic is your pillar content. A pillar page is a single, long page that gives a comprehensive explanation of the topic, but links to more in-depth cluster content. Think of your pillar page as the main idea you want to rank for. For example, if you’re a home cabinet company, you may want to rank for “kitchen cabinet remodeling.” Write a pillar page that covers all the basics of what someone would need to know about remodeling their kitchen cabinets. From there, you can link to other related content that digs a little deeper into specific issues, like which styles of cabinets that are right for a modern kitchen, or the pros and cons of solid wood vs. veneer cabinet doors. By organizing your content like this, you make it easier and faster for people to find related information, and you boost your chance of ranking for your central topic. Check out the video below for a more detailed explanation of how content clusters and pillar pages work. The way people communicate is changing. Once upon a time, all you needed was a phone number in order to conduct business. Then, you needed a website and an email address before people thought you were legitimate. Now, customers are looking for more instant access and response through messaging. Messaging has been around for a while (AOL Instant Messenger, anyone? ), but with the rise of mobile devices and social media, it’s become a primary method of communication for younger generations. And businesses can’t afford to ignore it any more. Facebook Messenger has over 1.3 billion users and 60 million businesses who send more than 2 billion messages to each other every month. Facebook reports that 56% of people would rather message than call customer service. Customers are also look for live chat support on your website. 44% of online consumers said that live chat during an online purchase is one of the most important features your website can offer. During the conference, Hubspot’s Dharmesh Shah reported that their messages app generated a whopping 20% conversion rate for their business, a significant jump over their other channels. The point: customers want to chat with your business. And if you’re not accessible, you’re missing out on a huge opportunity. Not only are you losing potential customers, you’re also missing out on a source of great customer insight. Live chat gives you the opportunity to know exactly what problems and questions your customers have during their buying process. That knowledge is golden and can help you create better content and improve your customer experience. First: Google. Since introducing RankBrain in 2015, Google’s algorithm has included machine learning. Through the power of AI, Google is literally teaching itself and getting smarter every day. Mere months after it was introduced, Google reported that RankBrain was its third most important ranking factor. We may soon face a day when an AI knows more about how to rank on Google than its own engineers. Chatbots are another form of AI that have been getting a lot of attention lately. While we probably don’t need chatbots who invent their own language, marketers are using chatbots to answer basic questions, provide research information, even perform transactions. Again, with the rising importance of live chat and messaging, customers expect near-instant responsiveness wherever, whenever, and with whatever they need. For most of us who don’t want to employ customer service staff round the clock, chatbots are a viable way to provide scalable, 24/7 customer support. Ever heard the theory that if you stick enough monkeys in a room with typewriters, they’ll eventually write Shakespeare? What if you stuck super-smart learning machines in a room? AI-powered content is already here, and it’s only going to grow smarter. If you’re tired of writing emails, there’s apparently a robot that can write subject lines better than you. News outlets like Forbes and the Associated Press are already publishing content actually written by AI, using tools like Wordsmith. Sure, AI might not be up to writing a novel yet, but it’s definitely doing better than the monkeys. “Is my marketing working?” It’s the million dollar question we all want to know, but can be so hard to figure out. With all the data and analytics tools out there, you can spend half your life measuring stuff and still not know the answer. One way to help is to put your data all in one place. 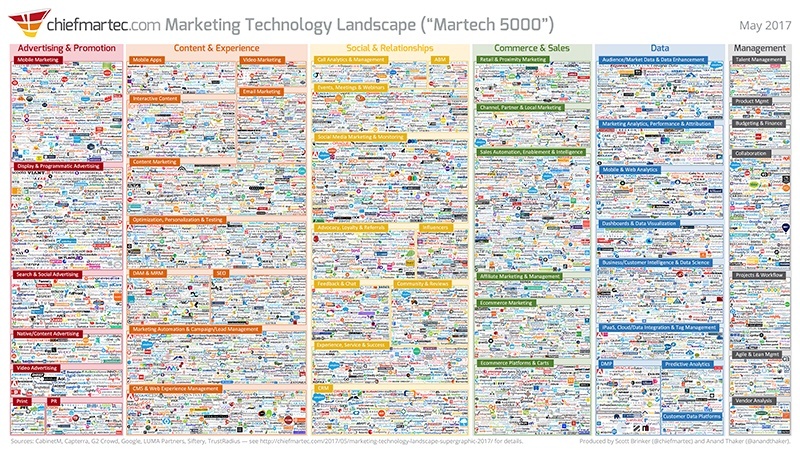 There are more than 5000 marketing technologies out there, and marketers use an average of 12 different tools to manage their marketing data and campaigns. Imagine if every time you wanted to measure your marketing efforts, you had to pull data from 12 different places. What a nightmare! That’s why many software applications run on an open platform, meaning they play well with others. Still, with a dozen different sources of marketing data, you’ll have an easier time if you can pull it all into one centralized location. While no single piece of software is going to do everything, a powerful, but open central platform can go a long way. With all your data in one platform, suddenly the possibilities for meaningful analytics explode. Imagine if you could track a person from the moment they first visit your website to the moment they become a customer, and every single touchpoint in between. That level of data gives you immense insight into the customer’s journey. We heard one account from a company who closed a $4M deal, because they were able to see the whole 6 month journey of interaction from a customer and respond with the exact right message at the exact right time. Even better, a strong centralized platform can help you relate your marketing campaigns to actions: new contacts in your database, appointments with your sales team, or even new customers. Coming home from this conference, we didn’t just want to have some notes and a list of things we learned. We want to put that knowledge into action. We’re already making changes that will improve our business and empower us to provide better service to our clients. And the conversations are still going – stay tuned for more news soon on how we're continuously improving! In the meantime, if you’re inspired to make changes to grow your business, please reach out and let us know. We’re here for you and always happy to help.